Arriving for their first tournament after an impressive World Cup campaign, Indian captain Saurav Ganguly today said the cricket tri-series would offer the youngsters in the side a good chance to prove themselves on the international stage. Ganguly said the new players in the squad had already proved their talent in domestic circuit and he was confident they would do well. With a spring in their steps and hopes galore, the rookies in the Indian team are aspiring to make their national call up memorable. Elated with their inclusion in the Indian side, three of the newcomers — young paceman Avishkar Salvi, Delhi opener Gautam Gambhir, and middle order bat Abhijit Kale — are upbeat about winning the Dhaka tourney beginning on Friday. While the contract of coach John Wright would be extended for one year, the Board of Central for Cricket in India (BCCI) was in the process of finalising talks with outgoing Sri Lankan coach Dav Whatmore to head the National Cricket Academy (NCA) in Bangalore. Steve Waugh will become cricket’s most-capped player when he plays in his 157th Test match against the West Indies in the first Test at the Bourda ground here tomorrow. Pakistan will have history firmly on their side in the Sharjah Cup final tomorrow, having not lost a one-dayer to Zimbabwe for four-and-a-half years. Beleaguered Sri Lankan skipper Sanath Jayasuriya is likely to relinquish his post once the team returns here after an unsuccessful Sharjah Cup campaign, cricket board chief Anura Tennekoon has said. There were no positive drugs tests at the 2003 cricket World Cup, the International Cricket Council (ICC) said today. Elite B will be under pressure to force an outright win if they are to overtake table leaders Elite A, when they take on Plate A in the final round of the Duleep Trophy Cricket Championship match at the M A Chidambaram Stadium here from tomorrow. Defending champions Mohun Bagan had all the lethal fire power. But JCT had Joe Paul Ancheri. In a see-saw battle for supremacy in the seventh National Football League, the tall and fighting-fit international played his heart out, moving up and down to defend his territory and attack the rival citadel with full backing from his team-mates. A blitz of fours goals including a hat-trick by Agnelo Gomes, who was also adjudged the man of the match, enabled formidable Arlem-sponsored Vasco Sports Club Goa outclass lowly placed HAL Bangalore by 8-0 after leading 4-0 at the breather in their 19th round Oil PSU National Football League match being played here at Nehru Stadium Fatorda today. India have drawn the Netherlands in their World Group play-off tie of the Davis Cup team tennis competition. Sri Lanka has denied there was any move to shift the jinxed South Asian Federation (SAF) Games from Islamabad to Colombo so that the oft-postponed event could go ahead. Shooter Manavjit Sandhu was given honorary membership of the Chandigarh Golf Association at the CGA Range, Kishangarh, here today. The spate of upsets continued unabated as fourth seed Digvijay Singh, seventh seed Amandeep Johl, ninth seed Gaurav Ghei and tenth seed Uttam Singh Mundy joined the casualty list in the Rs 1-lakh SRF Matchplay Golf Championship here today. Arriving for their first tournament after an impressive World Cup campaign, Indian captain Saurav Ganguly today said the cricket tri-series would offer the youngsters in the side a good chance to prove themselves on the international stage. Ganguly said the new players in the squad had already proved their talent in domestic circuit and he was confident they would do well and bridge the gap created by the absence of as many as five World Cup squad members. "Since many of the seniors are not here, the series offers a good opportunity to the youngsters to prove themselves," the skipper told reporters at a crowded press conference on the team’s arrival here for the tournament starting on Friday. Ganguly also said the team would miss the services of physio Andrew Leipus during the tri-series starting in Dhaka on Friday. “We will miss Leipus. It will be hot there so we needed a physio,” Ganguly said. Leipus, who was slated to accompany the team, was forced to change his plan after his wife met with an accident in Johannesburg. Physical trainer Adrian le Roux will double up as the physio. “Both India and South Africa have a lot of youngsters and the tournament would be good challenge,” he said. The 15-member Indian squad, sans several big names, fields new faces in Avishkar Salvi, Gautam Gambhir, Abhijit Kale and Amit Mishra while offie Sarandeep Singh has got a national recall after a fairly long gap. Ganguly said despite all the matches of the tournament being day-night affairs, heat and humidity would be crucial factors. “But that will not affect us that much as we are used to such conditions,” he said. Asked about his back problem, the skipper said he was struggling with it. “But, somehow it is okay with me”. 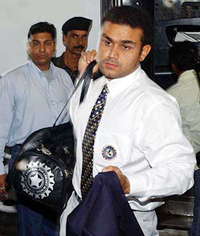 Ganguly had initially expressed the desire to skip the tournament to recuperate from the back problem, but changed his decision following a request from cricket board president Jagmohan Dalmiya. The stylish left-hander, who will be accompanied by wife Dona and one-and-a-half year old daughter Sana in Bangladesh, said the batting order of the team was yet to be finalised. While vice-captain Virender Sehwag would open the innings, his partner was yet to be decided. “Let us see how it goes. Sehwag’s opening partner would depend on conditions there,” he said when asked whether he himself would open the innings. Ganguly said he did not think the mantle of vice-captaincy would put additional pressure on Sehwag, a free wheeling stroke maker. “Sehwag should play the way he plays”. On whether players like Yuvraj Singh would have to take some additional burden with a number of seniors opting out, he said “why only Yuvraj? All of us will have to shoulder the responsibility”. The Indian team left onboard a Bangladesh Biman flight from the NSC Bose international airport at 11 a.m. Asked about newcomers like pacer Salvi and Delhi opener Gautam Gambhir, the skipper said he had neither seen nor spoken to them as yet. “I read about Salvi’s exploit with the leather in the West Indies. That impressed me and I wanted him in the team,” he said. The 21-year-old Mumbai speedster figured in the India ‘A’ side during the recent tour to the Caribbeans and finished as the highest Indian wicket-taker with 31 scalps. Commenting on the composition of the new-look Indian side, team manager Goutam Dasgupta said “it is a good blend of youth and experience and should do well. Alongside the youngsters, we have a number of players who did duty in the recent World Cup”. “I am hopeful that we will win the tournament,” said Dasgupta, who was manager of the national squad that toured the West Indies last year. With a spring in their steps and hopes galore, the rookies in the Indian team are aspiring to make their national call up memorable by chipping in scintillating performances in the Bangladesh tri-series. Elated with their inclusion in the Indian side, three of the newcomers — young paceman Avishkar Salvi, Delhi opener Gautam Gambhir, and middle order bat Abhijit Kale — are upbeat about winning the Dhaka tourney beginning on Friday. "We will put in our best efforts. We are a good side and capable of winning the championship," was the common refrain of Salvi, Gambhir and Kale, minutes before leaving for the airport from the team hotel here today. Not accustomed to the continuous glare of television cameras and the mad scramble from newspersons for quotes, they seemed awed by the occasion. "Being a part of the Indian team is a great experience. I am very positive about the Dhaka meet," said Salvi, who hogged the limelight after finishing as the highest Indian A wicket-taker with a rich haul of 31 scalps during the side's recent tour to the West Indies. Salvi's exploits drew praise from coach Ashok Malhtora, and impressed skipper Saurav Ganguly, who pitched for his inclusion. 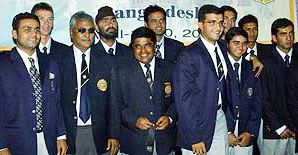 Gambhir, who regards Ganguly as his idol, said it would be a dream come true to open the batting with the Indian captain. However, with Ganguly saying at the airport that vice captain Virender Sehwag was sure to come as one opener, one doubts whether Gambhir's dream would be realised. Gambhir, another success story of the Caribbean, emerging as the top scorer for India A, aggregating 617 runs, said he was optimistic about continuing with the good form in Dhaka. Kale said he had been expecting a berth in the national squad for quite some time. "I have been playing consistently for the past couple of years. I was hoping to be included in the national side," he said. Another youngster, but a regular in the Indian team, Yuvraj Singh also said the team was confident of a good show in Dhaka. Though the decisions were to be ratified in the April 26-27 Working Committee meeting, it was more or less finalised at an informal meeting of the BCCI office-bearers at New Delhi last night, reports here said. The office-bearers had gathered at the country’s capital for the felicitation of the Indian squad by President APJ Abdul Kalam. As of now the contracts of coach John Wright, physio Andrew Leipus and physical trainer Adrian le Roux had temporarily been extended till May 24. The contracts of all three had come to an end immediately after the World Cup. The more dramatic development had been on the Whatmore issue. Whatmore was the coach of the World Cup winning 1996 Sri Lankan team and had been with the squad since then. The Lanka-born coach had played his cricket for Australia and he had also served as a coach to the Lancashire team. The tenacious 37-year-old, battling to prolong his Test career before a majestic century against England in the fifth Ashes Test in Sydney in early January, is now firmly back in charge as the Aussies attempt to retain the Frank Worrell Trophy in the four-Test Caribbean series. Waugh will pass another celebrated Australian cricketer Allan Border (156 Tests) in the Georgetown Test but has played down its significance. “I’m aware that I’m about to become the most capped player in the history of Test cricket, which is nice, but as they say records are made to be broken and someone will go past it,” Waugh said today. “I’ll have it for the moment which is nice but really it’s not something I can hang my hat on and say it’s the highlight of my career.” More pressing for Waugh is to get the Australians away to a winning start against the West Indians, who again are in a mess of their own making. Former West Indies captain Carl Hooper has pulled out of the series, reportedly saying he won’t play under new skipper Brian Lara. And 28-Test opening batsman Chris Gayle was left out amid reports the West Indies Cricket Board deemed him ineligible after playing in an ICC-sanctioned double-wicket competition in St Lucia. Team vice-captain Ramnaresh Sarwan is unavailable through injury and Gus Logie is the caretaker coach for the series after Roger Harper was dumped in the wake of the World Cup. “It’s difficult but this is the reality of the situation. The players will have to dig deep, obviously we all have to dig deep and try to get the players to play together as a team,” Logie said. Lara scored three centuries — one of them 213 in Kingston — to help the West Indies to draw the 1999 Caribbean series 2-2 and looms as the Windies’ great batting hope. Waugh will be without his two main bowlers, Glenn McGrath and Shane Warne, who between them have dismissed Lara 17 of the 40 times against Australia. McGrath returned home last week after his wife had been diagnosed with a secondary cancer infection in her hip. He intends returning to the Caribbean in time for the last two Tests in Barbados and Antigua. Warne is serving a 12-month ban for returning a positive drug test to a banned diuretic. “He’s a great player, there’s no doubt about that, and great players can overcome plans,” Waugh said of Lara, who turns 34 during this series. “The Test matches we’ve lost have been because someone’s put their hands up and played a great innings,” Waugh said. Pakistan have won the last 12 decisive encounters and only lost twice in 31 games against the Zimbabweans. The sides met in the World Cup last month but rain washed out the game, leading to Zimbabwe surprisingly reaching the second round ahead of Pakistan and England. Both sides have since seen a major change in personnel, with Zimbabwe losing key batsman Andy Flower through retirement. “Jayasuriya has indicated that he would like to relinquish the captaincy but he has not officially informed us yet,” Tennekoon said. “On his return from Sharjah he is likely to indicate what his position is,” the BCCSL chief told BBC Sport. The South African Institute for Drug Free Sport (SAIDFS) conducted 100 random tests on players during the tournament, won by Australia last month. Samples handled by the International Olympic Committee (IOC) accredited laboratory were found to be negative. Australia leg spinner Shane Warne was sent back from the World Cup after testing positive for diuretics, but he was tested before the start of the tournament. Warne has since been banned for 12 months. This was the first time dope tests were used at a cricket World Cup. They were carried out at all Super Six games, both semifinals and the final. “We don’t have an outright win in the league yet,” manager Vivek Jaisimha said after the two teams had a session at the nets. His team has 10 points from two first innings leads in three matches. Elite B will be strengthened by the return of the newly-married Rohan Gavaskar, who will be taking over as the captain. Plate A are poorly placed, with just five points from three matches. They will be without Deepak Chougule (Karnataka), J Jobanputra (Saurashtra) and Joginder Singh (Haryana) for the match. Ajay Kudua and Tinu Yohannan of Kerala and Pandey of Madhya Pradesh have been named as replacements. 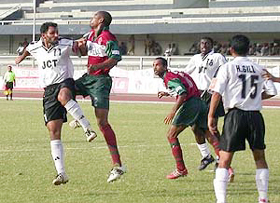 Defending champions Mohun Bagan had all the lethal fire power. But JCT had Joe Paul Ancheri. In a see-saw battle for supremacy in the seventh National Football League, the tall and fighting-fit international played his heart out, moving up and down to defend his territory and attack the rival citadel with full backing from his team-mates. The first half was barren but Ancheri looked unstoppable. The Mohun Bagan citadel ultimately fell five minutes into the second session, as Ancheri’s glancing header off a free kick by Ram Pal caught Mohun Bagan custodian Bivash Ghosh on the wrong foot. And the defending champions’ fate was sealed. In a classic display of team-work in which ‘man-of-the-match’ Ancheri played a stellar role, JCT Phagwara carried the day against Kolkata’s glamour outfit and the 1-0 victory boosted their chances of finishing in the top bracket. With three more matches in hand, the Phagwara mill men now hope to wipe out bitter memories of the previous season when they had escaped relegation by the skin of their teeth. Boasting of a fearsome strike force comprising Baichung Bhutia, Brazilian recruit Jose Barreto, attacking medio George Ekeh, and Renedy Singh, Mohun Bagan took the field as favourites but as the minutes ticked away, their desperation increased in the face of stout resistance. Every move was followed by well orchestrated counter-attacks as JCT gradually started calling the shots. JCT made the first serious attempt in the 10th minute as Joe Paul Ancheri’s through pass for striker Hardip Gill was intercepted by a rival defender. Mohun Bagan hit back with a counter attack but Jose Barreto’s power-packed volley narrowly missed the target. A free kick earned by Mohun Bagan midway through the first half after Barreto was fouled outside the box also proved abortive as Renedy Singh’s shot struck the wall of defenders. Soon after Jose Barreto looked extremely dangerous as he moved into the box but was dispossessed in the nick of time by stopper back Harpreet. Two minutes before half time, Mohun Bagan’s SK Sanjib was shown the yellow card for committing a foul against JCT’s Ram Pal but the resultant free kick by Hardip Gill sailed over. George Ekeh, who incidentally scored a hat-trick against JCT in the away match at Kolkata, displayed remarkable ball control but a knee injury forced him to quit two minutes before half time and his place was taken by Kajol Bhattacharya. As play resumed in the second session, JCT came firing on all cylinders. Ghanian recruit Kwabena Yeboah was almost through early on but Bagan defender Dulal Biswas made a timely clearance. This was followed by Ancheri’s piledriver which also sailed past the upright. It was in the 50th minute that JCT struck the fatal blow. A free kick by Ram Pal after Ancheri was brought down just outside the box saw Ancheri rising high to connect and his glancing header sailed into the net leaving the entire defence as well as goalie Bivash Ghosh perplexed. And then followed a JCT blitzkrieg. First Hardip Gill, Yeboah and Ancheri orchestrated a brilliant move. Yeboah back-heeled to Ancheri but the latter’s shot sailed over the bar. In the 65th minute, Mohun Bagan’s star striker Baichung Bhutia was substituted by Basudeb Mandal. JCT had another good chance when laborious winger Jaswinder moved in dangerously but the Bagan custodian rushed forward to tackle him. Jaswinder in a fraction of a second sent a back pass to Yeboah who only managed to shoot over with the goalie clearly out of charge. JCT custodian Mansuru Mohammed also thwarted Mohun Bagan’s designs through some brilliant saves. A curling left-footer from the sideline by Renedy Singh saw the ball dipping low but Mansuru tipped it over for a corner. Towards the end, substitute Charanjit made a couple of good attempts for JCT. First his brilliant header was punched away by Ghosh and then his reverse volley was saved on the goal-line by a rival defender. In injury time, Mohun Bagan’s Sunil Chettri aimed a powerful piledriver from 30 yards but Mansuru made an equally good save to compound the visitors’ misery. JCT will now meet Dempo in their last home match here on April 13. This was the biggest win of the season. For winners, the goals came through Marcos Pereira in the 4th, 15th, Agnelo Gomes in 32nd minute, 53rd, 54th, 56th minutes, Minino Fernandes in the 36th minute and Rui Wanderely Weis in the 81st minute. With this win, Vasco maintained their second place with 37 points registering 10 wins, seven draws and two defeats out of 18 outings, below league leaders East Bengal with 43 points. MUMBAI: Former Durand Cup winners Mahindra United scored once in each half to shock table toppers and Kolkata giants East Bengal 2-0 in the seventh OIL PSU National Football League at the Cooperage here today. Mahindras, who went ahead through winger Mongba Aby Samson’s superb free kick from the top of the box in the 33rd minute, increased their lead in the 66th minute when medio L James Singh was bang on target with a left footer off Samson’s cross from the left. With this win, the local outfit has garnered 26 points while the Kolkata outfit, who are sure of winning the league, have 43 points to their credit with just two rounds to go. BANGALORE: After a goalless first half, Salgaocar Sports Club, Goa, struck thrice to register a 3-0 victory over ITI Sports Club, Bangalore, in their 19th engagement in the 7th National Football League here today. Jatin Bist, substitute Prashanth Jaggi and Dharmjit Singh netted a goal apiece to ensure Salgaocar’s victory and help increase the team points tally to 35. Salgaocar scored in the 72nd minute when Jatin Bist sent a powerful shot into the net in a solo effort. Prashant Jaggi increased the tally seven minutes later when he made no mistake in heading the ball into the net off a good pass from Jos Esteves. Dharmjit Singh further consolidated Salgaocar’s position scoring the third goal in a solo effort during injury time. After making full advantage of the hot and humind conditions at home to beat New Zealand 4-1 in Kolkata in the Asia-Oceania second round tie, India will have to cope with the cold conditions of the northern winter when they travel to the Netherlands for the September 19 to 21 tie. The venue and the surface are yet to be announced. The Dutch blew a 2-1 lead by losing both Sunday’s singles in their 3-2 defeat by Switzerland in their first round match. Thailand though have been handed a great chance of reaching the Davis Cup World Group for the first time after being drawn at home against the Czech Republic. The Thais, who secured their place in the play-offs with a 4-1 win over Uzbekistan, will be confident that the advantage of playing in front of their own supporters can help them overcome the seeded Czechs, who narrowly lost out to Russia in this year’s first round in February. The USA’s punishment for losing to Croatia was another trip to eastern Europe, with Slovakia the opponents this time around. Sri Lanka’s National Olympic Committee (NOC) Chairman Hemasiri Fernando quashed a Pakistani news agency report which quoted unnamed "top officials" and said the games, which have been postponed thrice, may be shifted from Pakistan to Sri Lanka. "I cannot say whether the Pakistan officials have any such idea. But we have not yet been informed of it", Fernando was quoted as saying in the "Daily Mirror" today. Fernando said even if there was such a proposal, Sri Lanka was not in a position to honour it. "I am afraid we will have to refuse if such a proposal comes up at the next official meeting. Hosting SAF Games is no joke. We have to put infrastructure in place and also a lot of organising is required. "In the present situation, we will need at least another one and a half years to prepare for a meet of this magnitude", he said. Fernando also said it was very unlikely that Pakistani officials would hand over the games to Sri Lanka, who are to host the next edition, because they have strongly indicated that they want to host the games after a postponement. Manavjit, a native of Ratta Khera village in Ferozepore has brought laurels to the state as well as the country. In the just concluded World Cup-2003 at New Delhi, Manavjit had won a bronze medal in trap and helped India win the gold medal in the team event. In the Commonwealth Games at Bisley, he narrowly missed the bronze medal by 0.1 point. 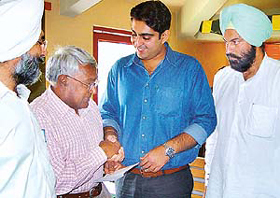 An Arjuna awardee, Manavjit was accompanied by his father Gurbir Sandhu, a former shooter and younger brother Karanjit Sandhu, who is a golfer. On the future of shooting, Manavjit was optimistic. By September, the Olympic quota place will be decided. So he is planning to take part n every major international competition this year. On being asked about his present score, Manavjit said, he was satisfied with his current score, which hovers between 120 to 125. On his forthcoming plans, he said in June he would go to Italy for a three-week camp to polish his skills. Manavjit shot to limelight at the age of 21 when he won a silver medal in the Bangkok Asian Games. To excel in shooting, apart from regular practice , he practises yoga to make him mentally stronger. 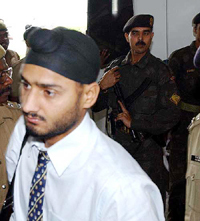 Manavjit said his employer, the Indian Oil Corporation, was assisting him in every effort to achieve more in shooting adding that it was his father Gurbir Sandhu, who actually provided him with a platform to do well. However, top-seed Arjun Atwal, unable to speak and facing the prospect of a minor surgery if the antibiotics don’t work on his infected throat, let his clubs do all the talking and beat veteran Basad Ali 4 and 3. No 5 Vijay Kumar, No 6 Shiv Shankar Prasad Chowrasia and No 8 Arjun Singh survived another day and set up some intriguing pre-quarter final matches. Vijay got the better of his Lucknow citymate Bhoop Singh 5 and 4, Chowrasia downed a battling Ali Sher 2 and 1, while Arjun Singh was stretched to the 18th hole before winning 2-up. Digvijay lost to a birdie from the local boy Vinod Kumar on the 19th hole, while Johl met a similar fate against Mohd Islam of Patna. Ghei found Jaiveer Virk’s putting abilities too hot to handle and lost 4 and 3,while Mundy was no match against a rampant Pappan, who was six-under after 12 holes in his 8 and 6 victory over the twice Honda-Siel PGA champion. Defending champion Shiv Prakash made full use of Amritinder Singh’s errant play and won 6 and 4, while Rahil Gangjee was a big winner, defeating Manohar Dike of Mumbai 7 and 5. First round heroes, Hem Chand, who knocked off Mukesh Kumar, lost to Devendra Patel 3 and 1, while Prem, who beat second seed Jeev, lost 4 and 3 to S Madaiah of Bangalore. Feroz Ali was taken to the 19th hole by Sanjay Kumar, while 11th seed Ashok Kumar was a 3 and 2 winner against Roop Singh. Vinod Kumar, took on Digvijay, who is enjoying superb form this season. After trading lead twice on the front nine, Vinod found himself two down when the Meerut golfer eagled the eighth and won the tenth with a par. He managed to pull it back and took the match into a playoff after winning the 18th with a birdie. On the first playoff hole, Vinod found the par-5 green in two and made a birdie, while Digvijay found the fairway bunker with his three-wood tee shot and could only make a par.